Memorial for the Nazi Victims of Oberursel | Initiative Opferdenkmal e. V.
The purpose of the memorial for the Nazi victims from Oberursel is to give the victims a face, to name them and bring them out of anonymity. The impulse came from Ernst Röder, son of an Oberursel resident murdered in Auschwitz. He wanted a place to commemorate his mother in his hometown. 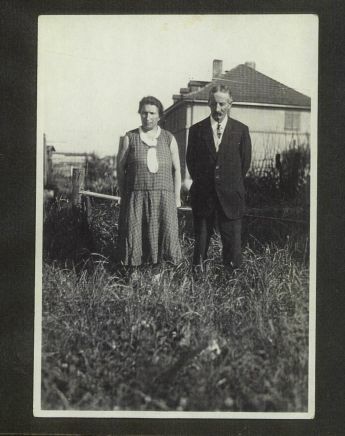 Ernst Röder’s parents in front of their house on Siemensstraße, Oberursel. Röder’s idea was picked up by the working group “Nie wieder 1933” (Never Again: 1933), a politically independent alliance of all interested organizations in Oberursel, A public design contest was held for the victims’ memorial, which should become a place of commemoration and warning. 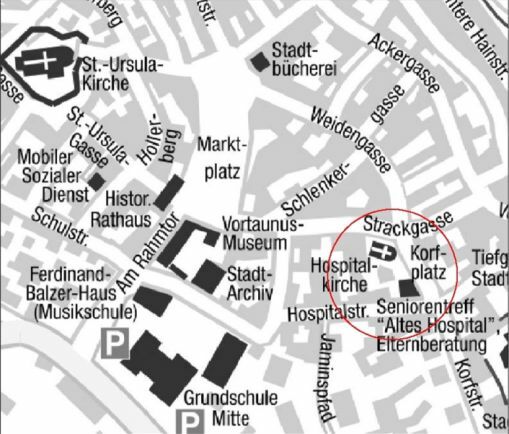 Finally, the working group chose a location next to the Hospital Church in the historic center of Oberursel. A jury chose the design by Juliane Nikolai (a student at Oberursel Gymnasium) among 50 proposals presented to them. 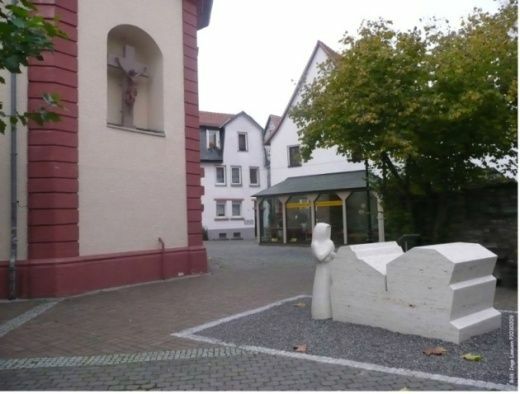 The jury consisted of representatives from the neighborhood of the memorial, youth, culture, the local historical society, Oberursel’s town hall, the working group “Nie wieder 1933”, and the society for “Christian-Jewish Cooperation in the Upper Taunus Region”. The sculptress Christine Jasmin Niederndörfer turned the sketch into a model. 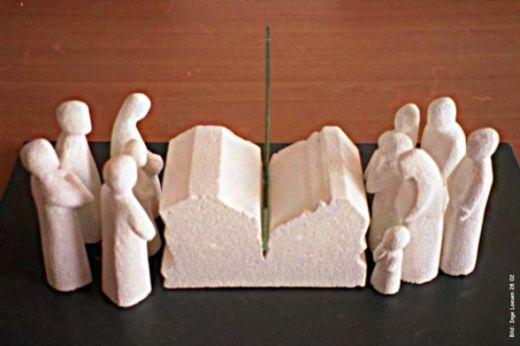 Two groups of figures are separated by a transparent glass pane set in a block of stone (Bavarian Jurassic limestone). The two groups face each other and represent the society on the one hand and the persecuted individuals on the other. 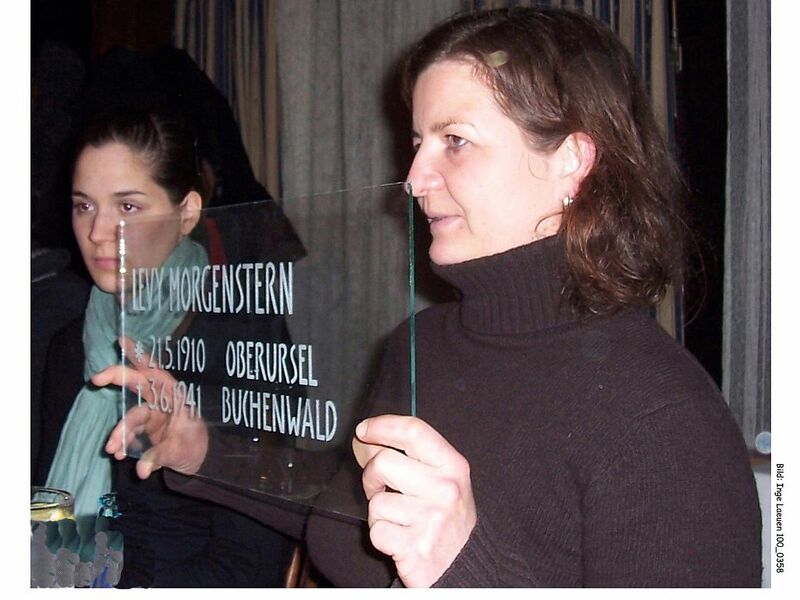 The glass pane will be inscribed with the names of Oberursel’s victims with dates and locations (if available) for both: birth and death. 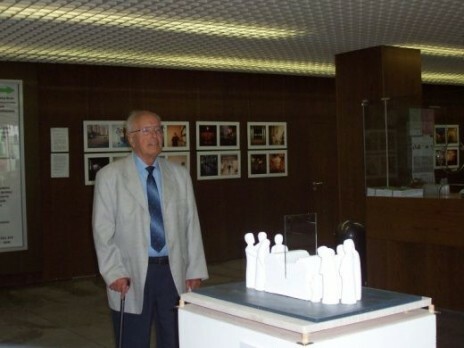 The visitor is encouraged to circle around the memorial and view both perspectives (the victims’ and the segregators’). There is still a long way to go until the memorial with its ten figures and the inscription of all names on the glass pane is completed. The working group “Never Again: 1933” relies on private sponsors and is involved in various events to collect donations for the memorial. It has been decided to develop the memorial step by step. The town hall supports the initiative by establishing a bank account for donations. 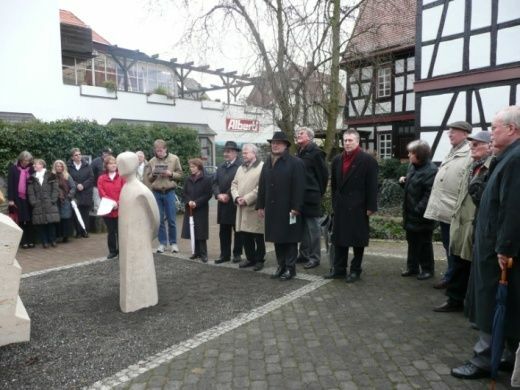 A society named “Initiative Opferdenkmal e.V.” (Initiative Victims’ Memorial) was founded. The first phase of construction was commissioned mid 2007. A ceremony took place in Hospital Church on December 10, 2007 to inaugurate the first part of the memorial, the middle piece and the first figure. dictatorship.” The society also took on the task of researching and documenting the political context and the victims’ fates. Dieser Beitrag wurde unter Denkmal abgelegt und mit English verschlagwortet. Setze ein Lesezeichen auf den Permalink.